B&W print depicts two unknown boys and one is wrapped in sheets which are knotted together. "Y" is written at the bottom of the image.Note: colour adjusted on jpg. B&W print depicts a camp scene with three unknown boys sitting on the edge of a tent platform and a fourth unknown boy standing behind them. "Y" is written on the lower centre portion of the image. B&W print depicts an unknown young boy wearing a white sleeveless shirt and white tennis shoes posing for the camera. "Y" is written on the bottom of the image. 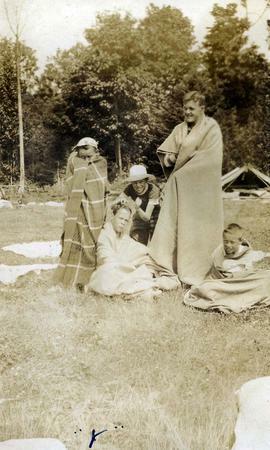 B&W print depicts a camp scene with a group of unknown boys sitting in a circle each with blankets over their shoulders. "Y" is written on the lower left corner of the image.Note: colour adjusted on jpg. 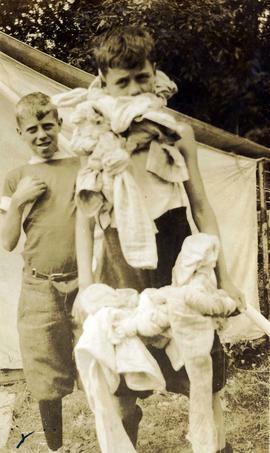 B&W print depicts a young Irving Snider wearing a white baseball hat and an unknown boy wearing a large floppy white hat posing for the camera. "Y" is written on the bottom of the image.Note: colour adjusted on jpg. B&W print depicts a young Irving Snider posing for the camera. "Y" is written on the bottom of the image. B&W print depicts a group of unknown boys sitting and standing posing for the camera with a building in the background that has Hopkins Landing painted on the side. "Y" is written on the bottom of the image.Note: colour adjusted on jpg.